← Virtual Release Party Tonight & You’re Invited! You may have already noticed it around the blog-o-sphere, but if not – this is pretty cool. Over 200 writers – published and not – are sharing the origins of their writing dreams. 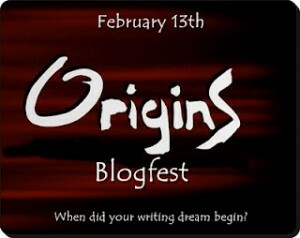 It’s the Origins Blog Fest hosted by the awesome quartet of Alex J. Cavanaugh, DL Hammons (Cruising Altitude 2.0), Katie Mills (Creepy Query Girl) and Matthew MacNish (The Quintessential Questionable Query Experiment). Go check out the loooong list of writers participating and see how they got started in this crazy journey of being a writer. I’ve talked about it before, so it may be old news for some, but I first wanted to become a writer when I was 8 years old. I’d started reading at 4 and loved books, but I don’t remember writing stories before the 3rd grade. It was spring and I had recently left Denver to live with my mother in Silver Spring, Maryland, because my dad, stepmom and sister were headed to Germany to set up house. I would join them later. After a couple of months of feeling like a loser and the end of the year quickly approaching, we started studying Tall Tales. I loved the unit and enjoyed all the stories. Then we were charged with telling our own Tall Tale or at least something mythical. I was stuck on ideas, until the weekend, when my mom took me to a cavern for the first time ever. I thought it was incredibly cool! And Mom got to talking about how she wondered if gnomes lived in the cave and only came out at night. My story idea was born. I went home and wrote it all out. Gnome Cave was my first ever story. And my first ever contemporary fantasy. AND it earned me an A. The only A on the assignment for the entire class. Was I proud? You better believe it! I beamed at all the other students who thought I was the dumb new kid. My teacher told me I had a knack for writing. My mom, grandma, aunt (all strong writers) – they all praised my writing and my story. And I decided then that I loved writing. I wrote – or I should say, started – several stories over the next 10 or so years. Nothing ever amounted to much, though, except for school assignments. I couldn’t come up with a whole story with a beginning, middle and end. But I still loved to write. I wrote for the yearbook and became co-editor my senior year. I wrote poems that were entered into contests and one published in a book. I wrote awesome papers for school. But by the time I had to choose a major for college, I’d decided I just didn’t have a novel in me. I started college for business. I changed my major to English. I dropped out and made a family, then raised the family. To bring in some extra cash, I typed term papers for college students, which led me into resume writing. Then writing and editing other marketing communications (brochures, newsletters, websites). I wrote and edited training programs. I wrote as a reporter and then served as editor for a newspaper. I returned to college and earned a bachelor degree in marketing. Every once in a while, I thought about writing fiction again, but nothing came to me. Thank goodness because, as a soccer mom/club president, editor/manager, wife/student/etc., I just didn’t have the time that would be needed to write a novel. Then I did get an idea. I ordered some craft books from Writers Digest, including how to get published. I immediately grew discouraged and my idea went no further than a chapter or two. After finishing college, I couldn’t wait to return to reading for fun. And boy did I! I devoured books as if I’d been starving – which I had been. I’d been starving for the escape of other worlds. I read and read and read. We moved to Florida. My kids were older, one driving and taking over some of my mom-taxi duties. The boys’ interests narrowed and I was no longer spending entire weekends and every weekday night on ball fields or courts or on the road driving to ball fields and courts. I had free time like I’d never had it before. I got into World of Warcraft for a while, thinking I could play with my boys, but they didn’t like playing with me. (I kinda sucked at it.) I read some more. I read Twilight. I got sucked into the series, but it left me wanting. Wanting more, wanting deeper – more of a plot, a true soul-mate connection, real bedroom scenes, better writing and, most of all, deeper characters. I realized I’d become tired of what was out there. I couldn’t find the story I really wanted to read, the characters I really wanted to love. I finally asked myself why I didn’t write what I wanted to read. And the idea to start writing fiction again began to flourish. I told myself I’d just play around, do some character sketches, just write for fun for myself. I still didn’t expect to have a book in me. But once I started, I couldn’t stop. In 6 weeks from the day I decided to give fiction writing another shot, I’d written what is now Promise and Purpose, ending it at 189,000 words! And not only did I have a full book in me, I realized, but an entire series. I haven’t looked back since. And now I have more than just one series idea. In fact, I have so many book ideas with beginnings, middles and ends, that I just hope I’m on this earth long enough to write half of them. Of course, now I hope, too, that there are readers out there who will continue to want to read them. That’s my story. Nothing crazy or surprising, but my story nonetheless. Now go check out some of those others. It’s astounding how many different ways we all came to this writer’s road. I certainly hope you’re on the Earth long enough to write them all too! What a fun blogfest, and I love your story! What a great Origins story! I’m glad you finally got back to reading then writing. And a whole series! I couldn’t even imagine doing that. I’ve only written one novel so far, but I just started my second. I hope I have as good an experience as you have had. I’m anew follower via the Origins bloghop. Thanks so much for sharing your origins! I agree- writing what we want to read is key. Every story is special. Thanks for sharing yours. And I love the title for Gnome Cave! World of Warcraft! Nothing like a gamer girl. I love your origins story. Cool that you got into WoW. 😀 Great to meet you on this blogfest. Writing is a passion if don’t have this is nonsense. Thank for sharing your ORIGIN!